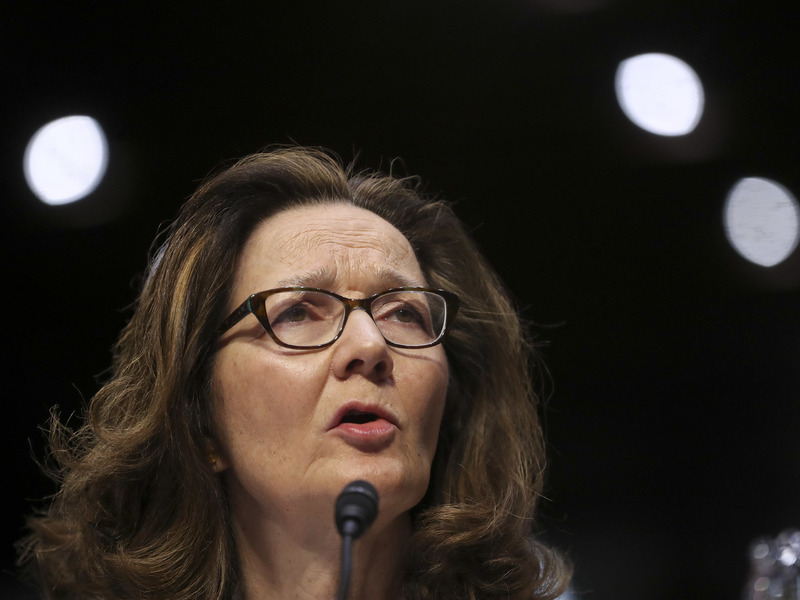 Sept. 11 Architect Wants To Tell Senators About Torture But Says Haspel Classified It : The Two-Way Khalid Sheikh Mohammed says he has information that could be relevant to Gina Haspel's nomination as CIA director. After his capture, Mohammed was waterboarded 183 times by the CIA. CIA nominee Gina Haspel testifies before the Senate intelligence committee on Wednesday. Alleged Sept. 11 planner Khalid Sheikh Mohammed says he has information that could be relevant to her nomination. President Trump's nominee for the head of the CIA, Gina Haspel, was questioned this week by the Senate intelligence committee about her role in the agency's interrogation program after the Sept. 11 attacks. "Under my leadership, on my watch, CIA will not restart a detention and interrogation program," she told the committee. But many senators believe she did not oppose torture strongly enough, and they pressed her on what her role was in the CIA's interrogation program. One person who says he has information the senators should know is Khalid Sheikh Mohammed, the mastermind behind the Sept. 11 attacks. Earlier this week, The New York Times reported that Mohammed had asked a Guantánamo Bay military judge for permission to share six paragraphs of information with the committee. "In the weeks after his capture, an Intelligence Committee report said, Mr. Mohammed was subjected to the suffocation technique called waterboarding 183 times over 15 sessions, stripped naked, doused with water, slapped, slammed into a wall, given rectal rehydrations without medical need, shackled into painful stress positions and sleep-deprived for about a week by being forced to stand with his hands chained above his head." David Nevin, Mohammed's lead defense attorney, told NPR's Scott Simon that his client believes he has information that is pertinent to Haspel's nomination. But Nevin can't disclose what Mohammed wants to tell the Senate committee, because the CIA has classified it. "Very uniquely in the history of classifications, his observations while he was involved in the torture program have been classified at the top secret level," Nevin says. "So there are distinct limitations on my ability to describe what it is he wants to say." Nevin says it shouldn't be difficult to give senators access to the information, but that opportunity has not been made. And, he says, during her nomination hearing this week, Haspel said she is the one who controls classification decisions — acting as the original classification authority for material related to her confirmation. "So it should be within her power to permit this to happen," Nevin says. Or not make it happen. "My client has a right under the Convention against Torture to complain about his torture and to seek redress for it," Nevin says. "The United States is one of 155 signatories to that convention, and the Senate ratified it. So yes, he would like to be heard on the question of what he knows about this." While he recognizes that Mohammed, who is accused of orchestrating the attacks that killed 3,000 people, isn't a sympathetic figure, Nevin says that doesn't mean his experience isn't relevant. "I guess the idea is that we're against torture unless it's something we really want to do, or it's a person we would really like to torture," Nevin says. "And you can see in articulating that, that that's not a rule of law at all. That's a government of men, not of laws."